Preparations for another busy year of Arianespace launch activity are fully underway at the Spaceport, with the initial Ariane 5 to be launched in 2017 now completing its initial build-up at the Spaceport in French Guiana. 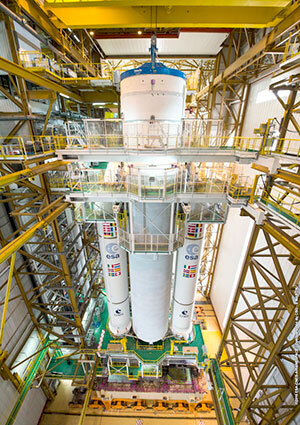 Ariane 5 is shown after installation of its “upper composite” section, consisting of the cryogenic upper stage and vehicle equipment bay. The mid-February mission – designated Flight VA235 – will orbit a pair of communications satellites: SKY Brasil-1 for operation by DirecTV Latin America; and Telkom-3S for Indonesian service provider, Telkom. Both spacecraft are scheduled to arrive at the Spaceport in early January. This flight will mark the 235th Ariane mission performed from French Guiana since the family of European launch vehicles began operation in 1979. During activity in the Spaceport’s Launcher Integration Building, the Ariane 5’s cryogenic core stage was positioned over one of two mobile launch tables operational for the heavy-lift vehicle, followed by the mating of two solid boosters. The launcher’s “upper composite” – composed of the vehicle equipment bay and ESC-A cryogenic upper stage – was then installed atop the core stage. This work was performed by production prime contractor Airbus Safran Launchers, which will complete the vehicle and deliver it to Arianespace in the Final Assembly Building. Arianespace has responsibility for overseeing the installation of Ariane 5’s SKY Brasil-1 and Telkom-3S satellite passengers, along with final checkout and launch operations. The heavyweight Ariane 5 is operated by Arianespace as part of the company’s launcher family at the Spaceport, which also includes the medium-lift Soyuz and lightweight Vega.